Ted Jackson, 84, long time successful coach of Michigan State Univ and Illinois State University passed away on Friday, September 20, 2013, Charlotteville, VA.
Tom Kane passed away May 5th in Pittsburgh. 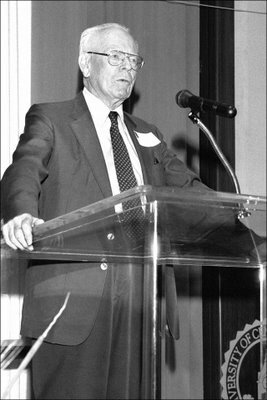 Tom taught at the University of Pittsburgh from 1965 until his retirement in 1999, coached the University of Pittsburgh to the National Debate Championship in 1981, and was twice named National Coach of the year by Emory University (1973) and Georgetown University (1981), named Honorary Citizen of Texas in 1982 for his work with high school debaters at Baylor University. 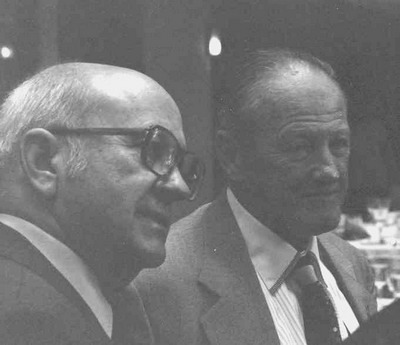 Pictured with Stephen Marzen and Mike Alberty in 1981 (Photo credit to Mike on NDT/CEDA Tradition FB page. Forrest Conklin, coach of the National Championship team from Carson Newman, passed away at his retirement home, in Knoxville, Tennessee April 2011. He had served as Director of Forensics, at the University of Northern Iowa until 1978, and continued as a Professor thereafter, until his retirement, in the late 90s. His wife was also a tenured professor at UNI, and retired at the same time. Among his debaters at UNI were Neal and Dana Phillips. Prof. John (Jack) A. Lynch passed away Dec 2 2010. He was 89 years old. Professor Lynch was the long time coach at St. Anselm College. In 1948, he founded the St. Thomas More Debate Society and had such great success that he was named chosen as the national collegiate debate coach of the year in 1970. 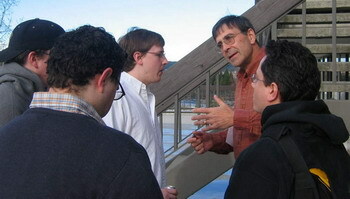 In his 46 years as coach, he authored more than 30 handbooks on national college debate topics. See memories of his long and influential career. Douglas Duke passed away on March 14th, 2010. A teacher for 46 years, Douglas Duke spent much of his coaching time with the University of Central Oklahoma. His college coaching career began back in 1962 when he coached at Southeastern State College in Durant, OK. He transferred to the University of Central Oklahoma in 1968 and remained there until his retirement in 2006. 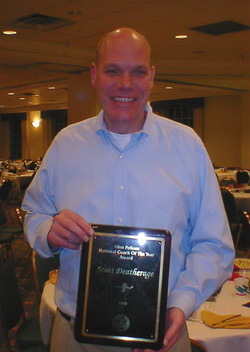 The Oklahoman: "In addition to many other awards and recognitions, his accomplishments included the following: 1990 - Cross Examination Debate Association National Championship; 1995 - CEDA Special Recognition Award; 1995 - National Cross Examination Debate Association President; 1995 - Pelham National NDT Debate Coach of the Year*; 1996 - National Cross Examination Debate Association Brownlee Award by his peers*; 1996 - Junior Debate National Championship; 1996/1997 - Oklahoma Speech Communication and Theatre Association President; 1998/1999 - Oklahoma Speech Communication and Theatre Association President. (*The only person who has ever won both of these awards)." John Lehman passed away in January 2010 at the age of 81. John was a former debate coach at Emporia State University and he served as the Director of this tournament in 1971 and 1972. 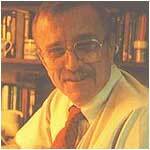 John was a professor of Communication and Theater at Emporia State University for over 40 years, retiring in 2004. Scott Deatherage - From Chicago Sun-times: "Mr. Deatherage, widely considered the nation's top debate coach, died on Christmas Day after suffering a heart attack two days earlier. He was 47. "There are 150 urban public schools that have debate programs as a result of his work with the National Association for Urban Debate Leagues," said Eric Tucker, deputy director of the organization, which Mr. Deatherage joined last year as executive director after leaving Northwestern. John Gossett passed away in Dallas, TX June 7th 2009after a long illness. John served as a teaching assistant and debate coach at the University of Houston from 1974-1976, and then earned his Ph.D. from the University of Southern California completing his degree in 1979. Before coming to North Texas, he served as the Director at the University of Northern Iowa (1979-1981). Gossett was a member of the North Texas faculty for 28 years, serving as Dept chair for 17 years and as Dir. of Debate for ten years. He was a member of the NDT Committee from 1982 to 1990, and a member of the NDT Board of Trustees from 1992-2002, (serving as chair for four years). Dr. Gossett was a driving force in the southwest for debate serving as the district chair and host multiple times. Gossett lead the North Texas debate program to be a perennial qualifier for the National Debate Tournament. Frank Harrison passed away Monday, June 1 2009, at his home in Galveston, TX. Frank was the Director of Debate at Trinity University for twenty years. During that time he was a tremendous coach, teacher, and friend to countless debaters both at Trinity University and within the debate community at large. 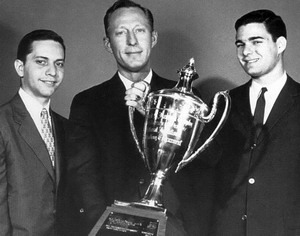 At the 1961 National Debate Tournament, Frank was third speaker and final round participant for King's College. He later earned a degree from Harvard Law and served as a United States Representative for the state of Pennsylvania. Debate, however, was his passion. He was the 2003 Dr. Lucy M. Keele Award winner, chair of the National Debate Tournament committee, and host of the 1991 National Debate Tournament. Although he had success coaching throughout the nation, his heart was always with the American Debate Association where he served in almost every official capacity including president. 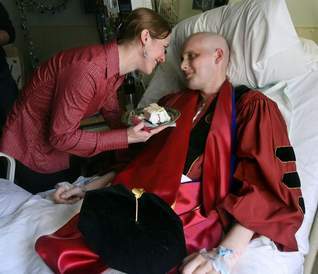 Matthew Grindy, Western Washington & Florida State – receiving his Ph.D. from Florida State, is sh aring a piece of graduation cake by his wife, Amber Bell. 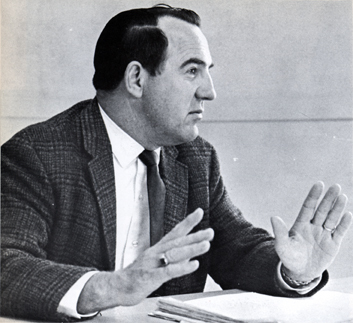 George Schell, Baylor – 2nd Speaker 1960, Top Speaker 1961, Two Semi-Final appearances at NDT. "For most of us during the crucial decade and a half starting in the mid-1970s - the decade in which many of us came of age or settled into our lifetime careers - Jimmy Unger WAS debate, debate as high art, debate as ritual, debate as relentless analysis, debate as bloodless battle. He lived it, breathed it, epitomized it, enjoyed it, perfected it, practiced it, and made it a permanent part of our lives. For all of that, and for the inestimable wit and twinkling wisdom that Jimmy exuded for so many years, we will all owe him a huge and permanent debt. May his memory live forever in and through those of us who cared about him and who were lucky enough to be his friends." 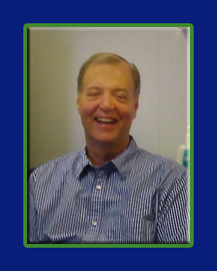 John Wallen - Claremont - passed away on May 8 in California. John was an imposing force in debate in southernCalifornia and across the country. He coached many great teams at USC, Redlands, and at Claremont.